Why do we bend sideways? One of the revelatory experiences I had in my viniyoga teacher training came after a side bending-focused practice. After doing a number of lateral bends and some breathing practices, my breathing felt so deep and smooth that I felt like I was floating on air. My ribcage seemed to expand almost endlessly and the inhalation became full and uninhibited. And since deep breathing has a profound effect on the entire system, I felt happy and content. This is one of the things that side bending helps to accomplish. By bending sideways we alternately stretch and contract the lateral structures of the torso (obliques, QL, iliacus, TFL, IT band) and facilitate deeper breathing by stretching intercostal muscles and expanding the ribcage. Lateral bending also helps to create more balance between the right and left sides of the body by working with each side individually – this will be our topic of conversation in a couple of weeks. On top of that, side bending laterally flexes the spine, which helps to alternately stretch and compress the deep spinal musculature, as well as lubricate the spinal discs. Depending on the type of lateral bends that we do, we can also involve the shoulder girdle and the hips. When you bend sideways, you contract one side of the torso and stretch the other side (1). If you add the arm movement, you will make the stretch more intense and add stretching of the shoulder girdle on one side (2). If you move the legs apart and turn one foot out, you will add the “pelvic opening”, which means stretching and strengthening the musculature of the hip joint, front of the pelvis and inner thighs. Group 1 poses emphasize the lateral stretch of the torso. Group 2 poses combine the lateral stretch of the torso with the “pelvic opening”; as a result, some of the side bend comes from the hip and the intensity of the lateral stretch is reduced. Group 3 poses focus on the “pelvic opening” component, they stretch and contract the muscles around the hip joint, particularly the muscles of the inner thighs. Many people won’t be able to keep the extended leg completely straight since it requires a lot of flexibility in the hamstrings. Keeping the knee bent will still accomplish all of the same goals. 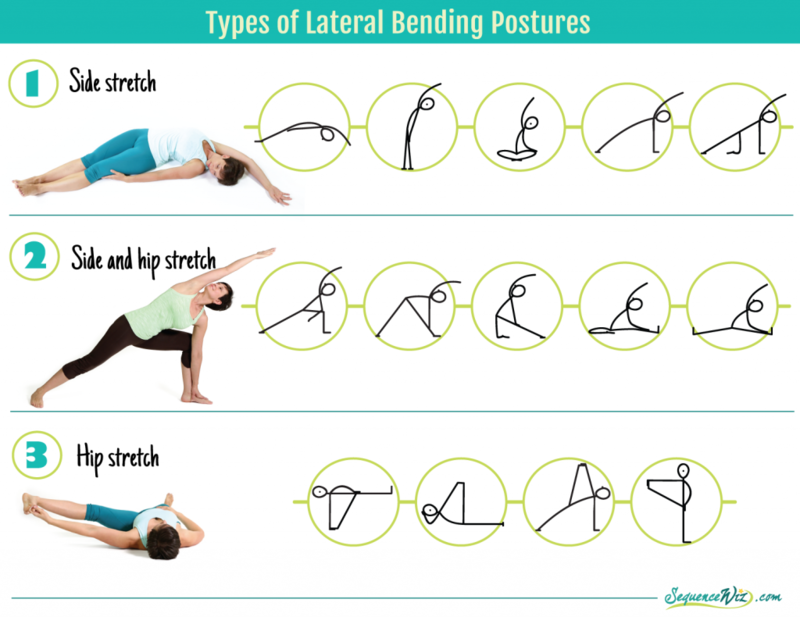 To summarize: Lateral bends are not that common in our daily lives, yet there are incredible benefits that can be gained from that movement, including improved breathing capacity, increased spinal mobility, better body symmetry and better range of motion in the shoulders and hips. But to be able to reap those benefits we need to make sure that we engage in “pure” side bending, instead of leaning forward and rotating the body. The trick here is to keep the body in one plane and to control the positioning of the pelvis and shoulders. Next week we will talk about the intricacies of the side bending technique and ways to troubleshoot the potential release valves. Tune in!